Dealing with a defiant toddler can be hard. 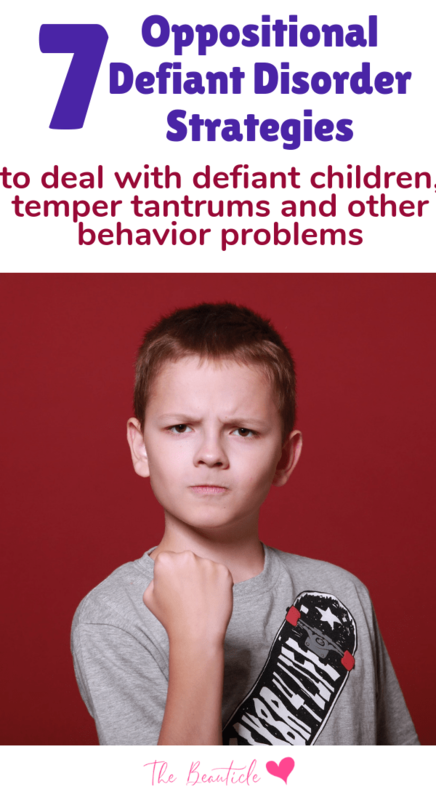 This post will share oppositional defiant disorder strategies for those who are parenting a child with ODD. This article will help your kids with ODD or other behavior problems like attention deficit hyperactivity disorder. Are any of your children difficult to handle? Maybe they are defiant, foul-tempered, or hard to get along with for more than five minutes. It might not be about your parenting but about their condition. Your children could be suffering from Oppositional Defiant Disorder or ODD.Parenting is not for the faint of heart, especially if you have stubborn or defiant toddlers or older children. You need to be prepared and more determined than your children are in order to help them get through the issues that arise. Having a game plan in place is crucial for your success and theirs. Consider incorporating these parenting strategies for dealing with defiant children. A defiant child tends to test your patience and parenting skills to the limit on a regular basis. This is just part of raising children, for the most part. All children go through at least two defiant stages – the “terrible twos,” when they learn to say “no” and throw frequent temper tantrums and again in the teen years, when they say “no” as they practice making mature choices and decisions. Try this amazing tool for monitoring your kid’s computer and internet activities. Children with ODD are highly disruptive. Just going out with your children can lead to problems. Normal outings are no longer enjoyable when children exhibit this type of behavior regularly and are likely to cause anxiety in the parents or caregivers. Children diagnosed with this condition are likely to suffer from additional issues. These can include ADD (attention-deficit disorder, ADHD (attention-deficit/hyperactivity disorder), anxiety, depression, dyslexia, and other learning disabilities. To help resolve the behavior issues, all of the symptoms and conditions must be addressed. As with many other conditions, the cause of ODD is not definitive. It could be biological. Chemical imbalances in the brain can lead to a number of conditions that manifest themselves in the body. Genetics can play a part if other family members have been diagnosed with ODD or other forms of mental illness. Environmental factors can also play a role, whether through food, air, or issues within the home. Labeling defiant children as “bad” could be detrimental to them. Something else could be at work in their bodies that might be going unnoticed. The key is to have children diagnosed by qualified professionals and address the ODD symptoms as well as any others that may present. Whether your child is going through one of the common defiant stages, dealing with ODD, or has another major issue, it’s important to address the problem early. In fact, at the first sign of defiant behavior, model and teach your child acceptable ways to react and respond. Here are 7 strategies to help you handle ODD in children and other defiance issues successfully. It is never too early to begin teaching your children good manners, conflict resolution, problem-solving skills, and social etiquette. The earlier you begin, the easier it will be for you and your children. Even before your babies are born, they are learning about the world around them – including actions, reactions, expectations, and consequences, or causes and effects. Don’t be afraid to start building the foundation during the baby stage by teaching your children important values and life lessons early. Establish boundaries and rules early. These should address your expectations for your children as well as your own conduct. When setting up consequences for your children, try to make them related to the specific issue. Write down the consequences so kids know what will happen if they choose to disobey or ignore rules. Depending on what your child responds to, you may restrict or disallow the use of an item, especially if it contributed to the infraction. Model a calm, cool, and collected attitude. A defiant toddler can be emotional and explosive. In order to deal successfully with children’s outbursts, you must control your own thoughts, emotions, actions, and words. If you need to, take time to calm down before addressing the behavior issue. When you talk with your child, keep your tone of voice low, firm, and decisive as you discuss family beliefs, values, expectations, and rules. When a child knows that consequences will not be enforced, they are less likely to follow the rules or stick to the boundaries. Your consistency in this matter will make a big difference. Don’t allow your child to stay home when you go out if they have abused the privilege. Make them go with you or stay with a relative instead of enjoying their freedom, while you are not home. When it comes to restricting the use of items, the loss of a cell phone, video game, computer, or television may be appropriate. Defiant children want the last word. They also want you to give in to their wants and way of thinking. Refuse to argue with them. End the conversation on your terms. Let the air out of that balloon, so to speak. Don’t let them wear you down. You have to be more determined than they are. Bargaining is a tool used by kids to get their way and get out of dealing with their responsibilities. No matter how they cry or complain, they must fix their mistake and then accept the consequences. Instead of giving attention when they do something wrong, praise and reward their positive behaviors. Point out when they do something well or made a thoughtful decision. Don’t skimp on the positives if you want your child to model them. Parents must take the time to plan and strategize when it comes to dealing with defiant children. As stated earlier, you have to be determined and consistent when it comes to dealing with your stubborn or defiant children. Make your plan and include one or more of these 7 parenting strategies with your defiant children.